Twitter realized a 29% year-over-year increase in advertising revenue, meaning more businesses are taking to the service to market their products and services. If you have a business on Twitter, you could receive tweets frequently, some within seconds of each other. It is very important that you respond to them promptly in order to satisfy your customers. While it is great that Twitter sends out a notification whenever there’s an event on your account, it would be even better to receive a real-time SMS. In this tutorial, we are going to learn how to send an SMS when an event occurs. Let’s start by creating our project directory. I have named mine Twitter-Twilio. We need two dependencies for this tutorial, Twilio SDK for PHP, which makes it easy to interact with the Twilio API and TwitterOauth, a PHP library for use with the Twitter OAuth API. That’s all we need to do for now. We’ll come back to this directory later. Before we delve into that, you need to create a Twitter Developer Account if you don’t already have one. Your account has to be approved before you can access the API, so make sure to confirm your email at the end of the application. Also, make sure to check your inbox if they request more information about your usage of the API. On the Apps page of your approved developer account, create an app. I have named mine Twitter-Twilio. On the Permissions tab of your app, enable read, write, and direct messages. Lastly, click on the Keys and tokens tab. You’ll find your app’s consumer key and token. Generate your app’s access token and access token secret. Take note of all the keys and tokens. We’ll use them later in our code. We need to get access to the Account Activity API. Navigate to the Dev Environments page, and under “Account Activity API Sandbox” click “Set up dev environment”, name the environment and select the Twitter app. I named my dev environment “development”. Take note of what you name your dev environment, we’ll use it later in our endpoint URLs. consumer_key        = "INSERT TWITTER CONSUMER KEY"
consumer_secret     = "INSERT TWITTER CONSUMER SECRET"
access_token        = "INSERT TWITTER ACCESS TOKEN"
access_token_secret = "INSERT TWITTER ACCESS TOKEN SECRET"
screen_name         = "INSERT TWITTER SCREEN NAME"
twilio_token        = "INSERT TWILIO TOKEN"
twilio_sid          = "INSERT TWILIO SID"
twilio_number       = "INSERT TWILIO NUMBER"
Note: You can find your Twilio credentials from your Twilio project dashboard. So far we have created a Twitter app and requested access to the Account Activity API. The next step is to create a webhook that will receive Twitter events. As described in the documentation, our first step is to write code that receives a Twitter Challenge Response Check (CRC) GET request and responds with a JSON response. Note: In the URL account_activity/all/development/, “development” is the name of my dev environment. Make sure to replace it with yours if you chose a different name. We have used TwitterOAuth to handle authentication and to make a call to the webhook registration URL. Make sure to replace the value of the $webhook_url with the https URL you got from ngrok. Upon a successful webhook registration, we will be subscribed to our Twitter app. Note: Remember to enter a verified phone number if you are using a trial account, otherwise enter any number you’d like to receive the notifications from. Congratulations! 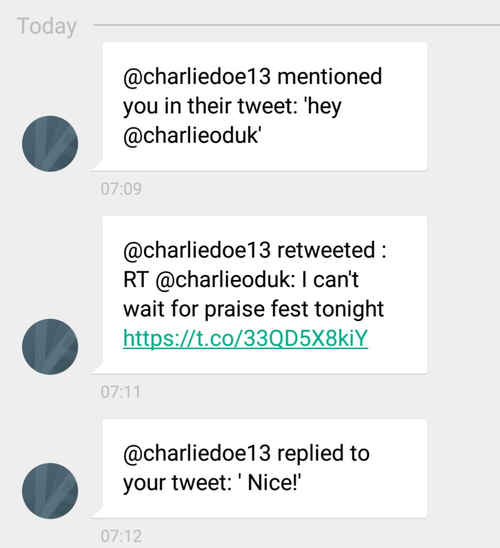 You have just set up a webhook to listen to Twitter events and send corresponding SMS texts using Twilio. Twitter Account Activity API can be used for a lot more than we have just done. You could work on building a customer service chatbot that not only alerts you about your customers concerns, but also provides a timely response. I look forward to hearing about your projects.